Monday’s we like to post about recent projects but progress has been slow this past few weeks with lots of rain and temperatures in the 30’s and 40’s. This makes it hard for the soil to ever dry out. I recently got a lovely card from a past client and that gave me the idea to share their project with you that we did in 2012. We will be back there soon to add a piece that was saved for a later date. 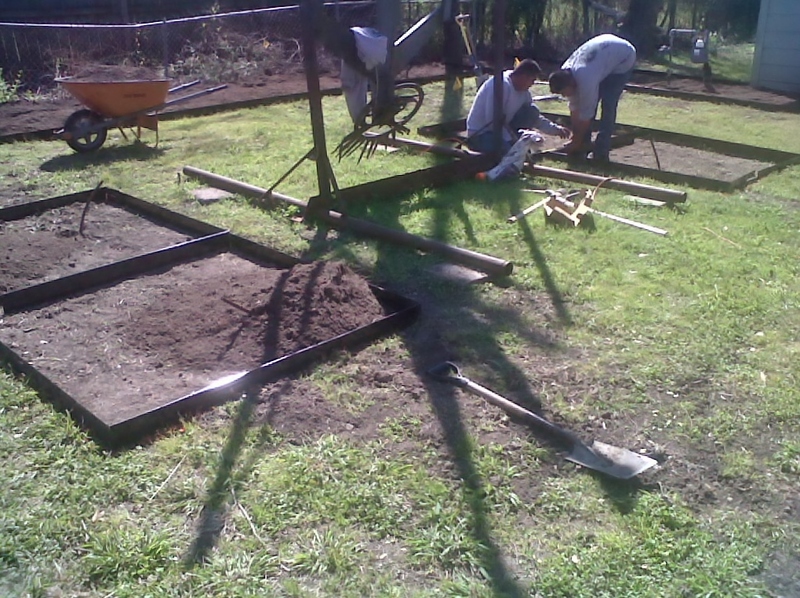 The garden space was big and almost a blank slate, even the lawn was mostly dead due to the drought. The main feature was a very large sculpture they called the red man. 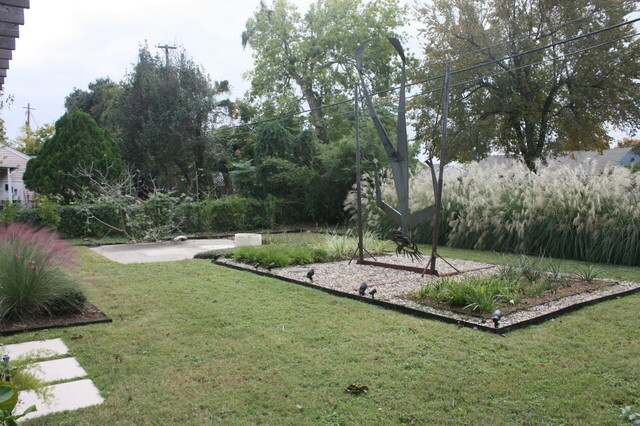 It dominated the space and marrying it to the rest of the landscape was an interesting challenge. This couple love their home and are happy to spend time on the garden but they still wanted low maintenance and drought tolerant plants. 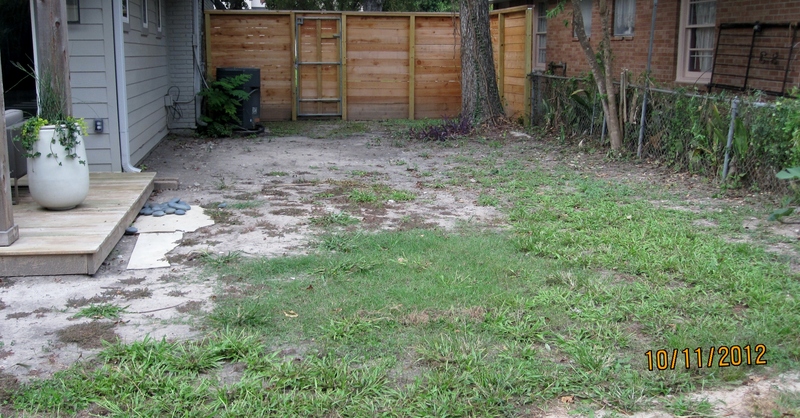 Before, notice the over grown vegetation along the back fence. They had recently renovated and updated the inside and the look of the home was now modern with lots of windows that looked out on to the back garden. 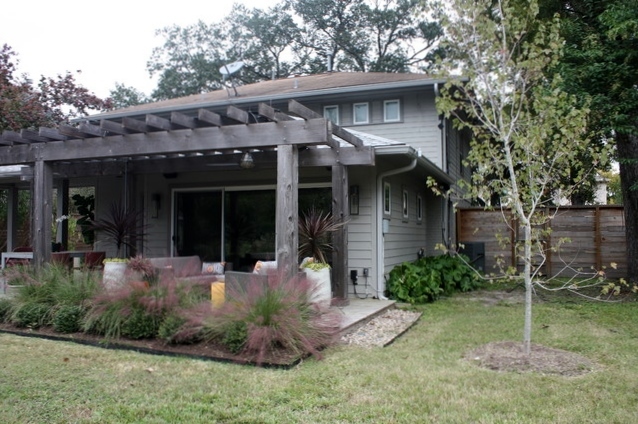 They had added a beautiful deck and pergola along the back that had strong clean lines. When we talked about style, words like Asian, Zen and modern came up! Here is the working plan. Originally we were talking about rainbow gravel instead of lawn in the main part of the yard but in the end they decided to get the grass to grow back. Now that we are back to normal rain I am happy we did because Saint Augustine grass in Houston is very low maintenance. And this is a hot space that needs the cool of the green grass. Here at Ravenscourt even though we have irrigation for our lawn, I think we only ended up watering it 3 time last summer. 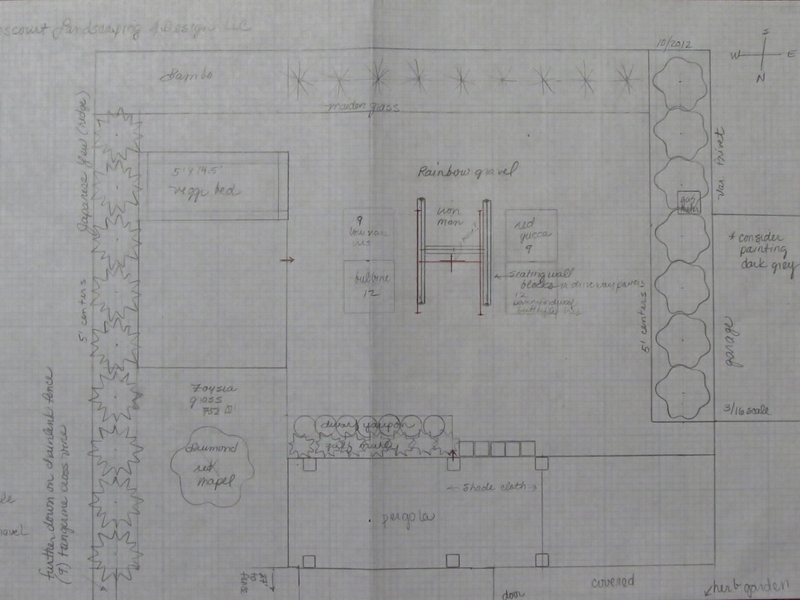 The addition we are coming back to do is a raised vegetable bed at the end of the old cement patio that used to have the old red brick fireplace/smoker. 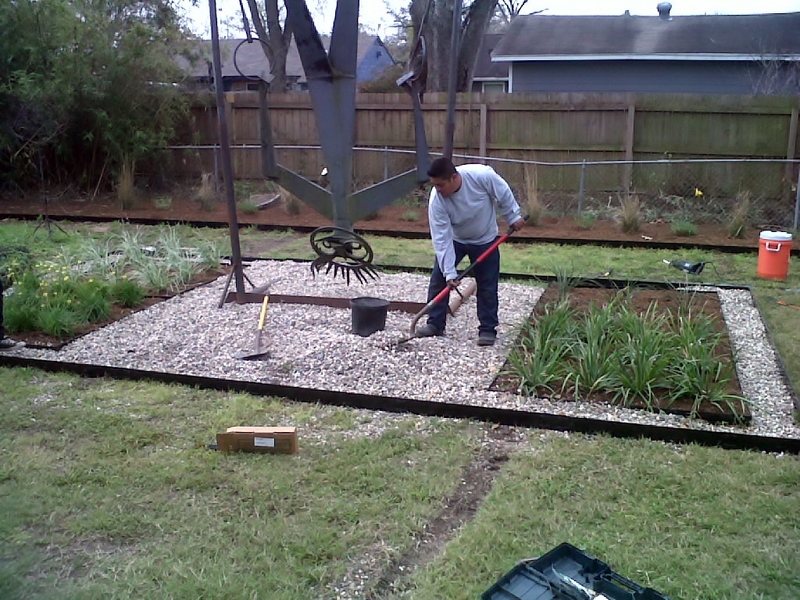 The beds will be seating height and are an easy way to grow vegetables. 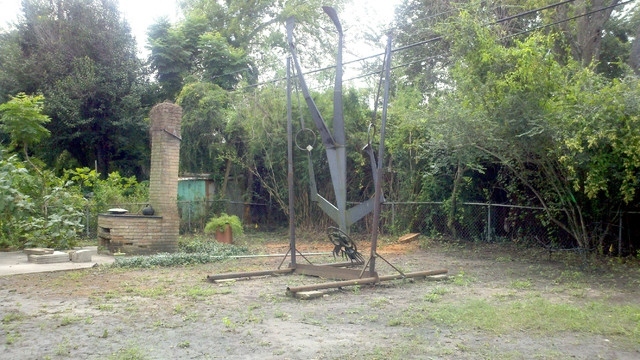 I designed four large beds to surround or frame the large sculpture. We also had to move it to make it more centered when viewed from inside the house. That was not an easy task. We like to use 10 gauge black steel edging because it has a more crisp modern look and is quite sturdy. In time it disappears as the plants grow in. Each bed has a field of a different type of plant. The front right is Danny’s Dwarf Butterfly iris, behind it are red yucca. To the left we have bulbine and behind that Louisiana iris. In the back ground you can see we cleared most of the over grown volunteer plants and planted a row of one gallon Maiden Grass in the bed. Quite a difference. This is about 6 months after we did the install and you can see that the Maiden grass has filled in and created a beautiful soft screen to hide the metal chain link fencing and neighbors wood fence. The tree is a Drummond Red Maple which grows fairly fast and will help shade the porch from the southwestern sun in the later afternoon during the summer. The gulf muhly is in full bloom and their is a neat row of dwarf yaupon in front of them. We did have custom made shade cloth that blocks out about 70% of the sun and added it to the top of the pergola. 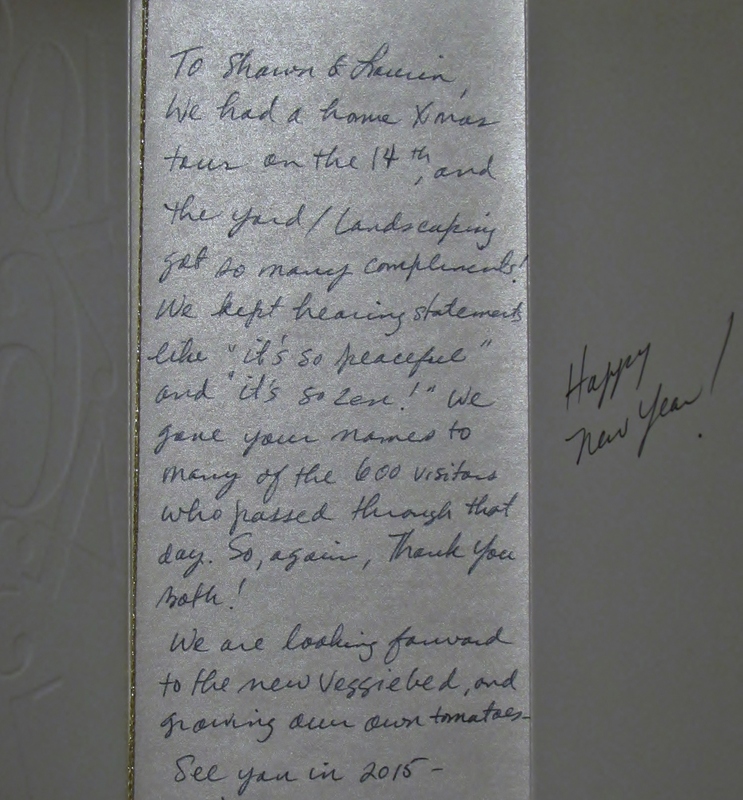 Here is a card we just received from the homeowners. I have to say while we do work to earn a living getting a card like this really makes it worth while! Happy Gardening! I love what you’ve done here, Laurin – I’m especially intrigued and delighted with the ways that you’ve used the various grasses. I have a very dark area by the side of the house that I’m going to use for some container gardening this year – at the moment, it seems to have become a general dumping ground for old pots (how does that happen I wonder? It must be the garden fairies 🙂 ). Do you have any advice about growing grasses/ferns in containers, especially in an area without a lot of light? Thank you BW! I love grasses too but for the most part they need full sun. Perhaps you can find some in your area that don’t need as much. Fern thrive in low light. I use a lot of holly fern,Cyrtomium falcatum ‘Rochfordianum’ and Autumn fern, Dryopteris erythrosora here in Houston in shaded areas. They are both hardy. Here at my home i have some Japanese painted fern that I love. Athyrium niponicum var. pictum . All ferns like rich soil well drained soil and should not be allowed to dry out. They really don’t need much fertilizer, we like to spray them with liquid seaweed extract now and again. I also have Southern Wood fern that has always been on my property and I am trying a few others. I think a pot collection (i think pots breed, lol) with a fern collection would be interesting and very little trouble except keeping them watered. Your maiden grasses in mass is amazing, in such a short time. I like this modern look…much to figure out for me in some of this effect, since I tend to be more eclectic. I love geometry and the contrast of clean lines and the soft flowing nature of plants. I have to work harder to do naturalistic plantings. Thank you for sharing your wonderful experience and design, Laurin! You are very welcome. We are pleased you like it!